Herbert Woollin was born in Staincliffe, Dewsbury on the 24th March 1892, the son of Alverthorpe-born, Hall Woollin, and, Gawthorpe-born, Martha Ann (nee Taylor), who married at Dewsbury All Saints Church on the 24th March 1883. Hall Woollin and his wife Martha plus six children: four girls and two boys, born between 1884 and 1905, were living in Dewsbury in 1891 and 1901, but by 1911 the family have moved to Cross Street, Gawthorpe. Hall Woollin worked as a coal miner, most probably at Low Laithes Colliery. He and his wife Martha had ten children from their marriage, but only six survived to 1911. Both sons, Elmsall Woollin (born 1890) and Herbert Woollin were also miners at Low Laithes Colliery. At the time of Herbert Woollin's death in 1918, his parents were living at 24, School Street, Gawthorpe, Ossett and his father Hall Woollin died in 1927 aged 65. Herbert’s army service record has not survived. His MIC records that he embarked for Egypt on the 22nd December 1915 and was subsequently awarded the 1914-15 Star in addition to the British and Victory medals. Herbert’s brother, Elmsall (named after his grandfather), enlisted on the 14th December 1914, and joined the King's Own Yorkshire Light Infantry, service number 201555. He reached the rank of sergeant, but was discharged on the 31st October 1918 after being badly wounded and losing an arm. There is no record of Elmsall Woollin being awarded the 1914-15 Star medal, suggesting that he did not serve overseas until after the 31st December 1915. His army service record has not survived. Elmsall Woollin married Lilly Tomlinson at Gawthorpe and Chickenley Heath Parish Church on the 7th September 1911. They had two children, Herbert, born 1912 and Clifford, born 1914. Elmsall of 12, Sandal Terrace, Norland, Sowerby Bridge, died on the 15th August 1959, shortly before his 48th Wedding Anniversary. The administration of his estate was granted to his widow, Lilly Woollin. The history of the 12th Service Battalion (Miners)(Pioneers) King's Own Yorkshire Light Infantry dates from the 5th September 1914 when the War Office authorised the West Yorkshire Coalowners Association to raise a Miners Battalion for the King's Own (Yorkshire Light Infantry). After beginning its life at Leeds, the battalion trained first at Farnley Park, Otley and then at Burton Leonard, near Ripon. By this time it had been allocated to 31st Division as its pioneer battalion. After completing its training in Yorkshire, the battalion moved to Fovant, Salisbury in October 1915 before embarking for Egypt on 6th December. After little more than two months in Egypt, the 12th K.O.Y.L.I. was ordered to France to take part in the planned summer offensive on the Somme. It is thought that Herbert Woollin was wounded and captured by the Germans during the defence of the Nieppe Forest on the 13th April 1918. The KOYLI 12th Battalion was attached to 31 Division as their Pioneer Corps, i.e. tasked with work such as digging trenches. In their kit, they carried a pick for this work and few rounds of ammunition than normal infantry soldiers. 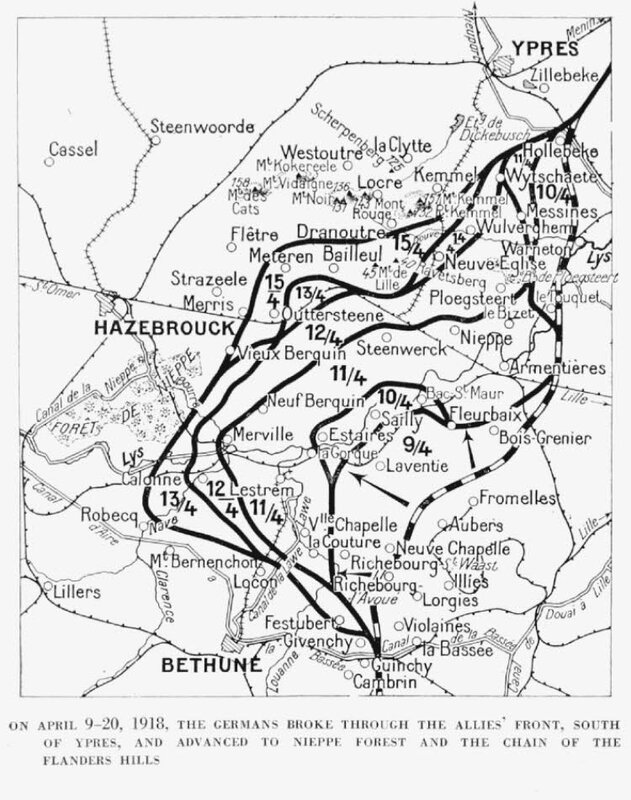 At least four German Divisions of the 6th Army attacked the Nieppe Forest towards Hazebrouck on the 13th of April, but made little progress until late afternoon. This is the tactical incident referred to in the official history as "The Defence Of The Nieppe Forest" and is the first of the two major German attacks of the day. This sector directly covered Hazebrouck; an area lying approximately between Merville and Merris, centred on Vieux Berquin. This was held by the left wing of 95 Brigade (50th Division), 4 Guards Brigade (31st Division), remnants of 86th and 87th Brigade (29th Division), holding less than 1,000 yards, and also 92nd Brigade (31st Division) with remnants of 92nd and 93rd Brigades attached as composite battalions. The 4th Guards Brigade with 12/KOYLI (attached pioneers of the 31st Division) took the worst of this prolonged German assault. At the height of the fighting the greater part of three German Divisions attacked the 4,000 yard front held by 4th Guards and adjacent units. "Ossett Soldier's Death in Germany - Enlisting at the outbreak of the war and going through the worst of the campaign in various theatres of operation, Private Herbert Woollin (26), K.O.Y.L.I., younger son of Mr. and Mrs. Hall Woollin, of School Street, Gawthorpe has died whilst a prisoner in the care of the enemy at Limburg. 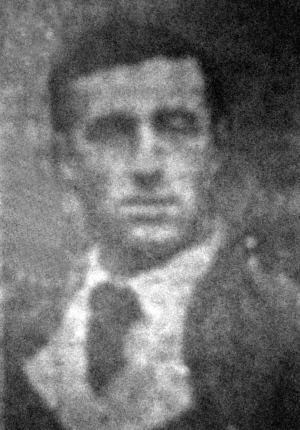 Deceased, who used to work at Low Laithes Colliery, first went out to Egypt in December 1915, but in June of the following year he was transferred to France, a month later he was wounded and invalided home. Then, at the beginning of 1917, he returned to France, and was severely wounded and taken prisoner at Kemmel Hill in April last year, his death now reported to have occurred during the same month. His elder brother, Sergeant Elmsall Woollin, is now discharged from the army having lost his right arm and sustained other injuries during the war." Private Herbert Woollin died in a German PoW camp on the 24th April 1918 at the age of 26 years and is buried in the PoW section at grave reference III. C. 14. in the Lille Southern Cemetery,2 Nord, France. Lille was occupied by the Germans from the 27th August, to the 5th September 1914, and again on the 12th October 1914; and it remained in their hands, undamaged by Allied artillery, until the 17th October 1918. Southern Cemetery was used by the Germans during the greater part of the War, and after the Armistice by the 39th Stationary Hospital and the 1st Australian Casualty Clearing Station. During the 1939-45 War, at the end of March 1940, the 50th Division was near Lille; while in May the same year No.10 Casualty Clearing Station used the Cemetery from the 16th to the 25th of the month. There are now over 600, 1914-18 and nearly 300, 1939-45 war casualties commemorated in this site. Of these, a small number from the 1914-18 War are unidentified and a special memorial is erected to one soldier from the United Kingdom known to be buried among them. From the 1939-45 War nearly 40 are unidentified. The French number of Plot I is V.2; that of Plot II, V.4; and that of Plot III (where British prisoners of War are buried) J.1. The Second War graves are in french Plot 82.